Brisbane, Qld (8 March, 2016) – Marking half a century of serving aerial markets around the world, Genie, the Aerial Work Platforms (AWP) segment of Terex Corporation, is celebrating the major milestone anniversary with its customers worldwide. Underscoring its 50-year legacy, Genie has become a truly global presence, operating in 80 countries, including Australia and New Zealand, making it the number one aerial work platform manufacturer in the world*. “This is a fantastic result for Genie, which was founded when Bud Bushnell bought the manufacturing rights to a material lift that operated on compressed air,” said Brad Lawrence, General Manager Australia, Terex Aerial Work Platforms (AWP). As demand for material lifts and aerial work platforms has grown, products such as man-lifts, stick booms, articulated booms, light towers and telehandlers have been added to the Genie® product line. Underscoring the pervasiveness of Genie, its equipment is used in a variety of industries and applications worldwide, including rental, aviation, construction, entertainment, government and military, industrial, as well as warehouse and retail. “From the very beginning, Genie has been working to develop products that solve our customers' worksite challenges — and that process never ends,” says Lawrence. 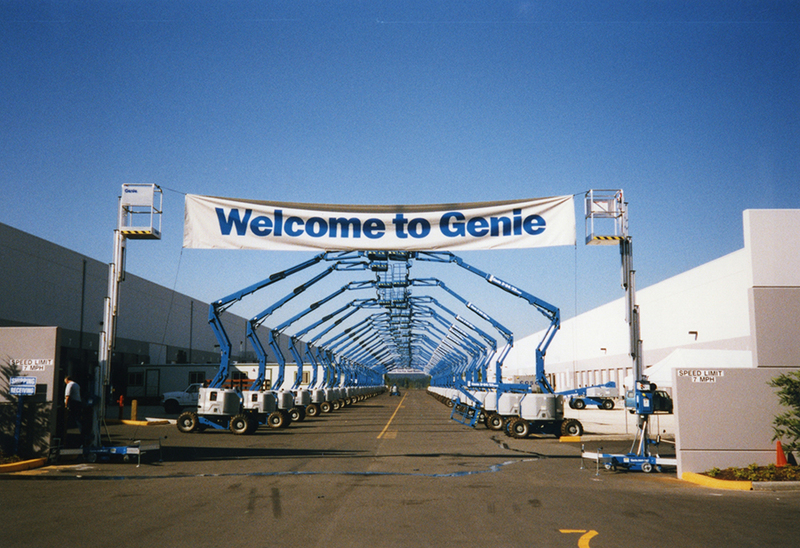 Since 1966, Genie has gone above and beyond in its product development efforts, focusing on what customers need to be successful in their industries and applications — Genie innovations are changing the market and setting the industry standard for quality, reliability and safety in aerial lift equipment. Hydraulic push-around lifts featuring a unique interlocking mast design. These evolved to AWP push-arounds that became an industry favourite, due to their ground entry for operators and portability on jobsites. Articulating Z™-Boom Lift category. Genie introduced the Z-30/20 model in 1985, which launched the company into the rental market. 40-ft Scissors: Genie offers more full-drive height models than its competitors, including the GS™-4069 and GS-4047 models. Genie SX-180 Boom Lift: Genie was the first to market with the world’s tallest, self-propelled boom. X-Chassis: This expanding axle design revolutionised the mechanism for extending and retracting the axles on Genie booms to and from the stowed position. Active Oscillating Axles: This feature allows Genie boom operators to safely maintain contact with the ground on uneven and undulating surfaces, enabling the unit to retain maximum power and torque. Genie also set new industry standards for many widely adopted products and technologies, including dual parallelogram, rotating, fully articulating and extending jibs, true crab steering and the TraX™ track drive system. Moreover, the AWP leader has no plans to slow its progress in “Building the Future,” according to Lawrence. “We’ve got brand-new ideas that we’ll be turning into reality within the next two years. We never stop moving forward — we keep taking our customers and their businesses higher,” he said. “In the next 50 years, we’ll continue to reach new heights, fit into new classifications and categories and continue to increase our customers’ rROIC,” he finished. *Based on 2014 aerial work platform global equipment revenue (Access International, May/June 2015). Includes powered access manufacturers. Excludes telehandlers and manufacturers of non-powered access equipment.